In machine knitting, stitches are usually brought into hold opposite the carriage. If multiple stitches are brought out to hold on the carriage side, floats are created. Triangles stacked vertically as seen in the previous post, will create a spiral curve along the line where stitches are held. The carriage needs to get to the opposite side and back after each ‘decrease’ or ‘increase’, so pairs of rows are used to execute and reverse angles in short row shaping. When multiple rows are knit independently from the rest of the knit, slits are created. 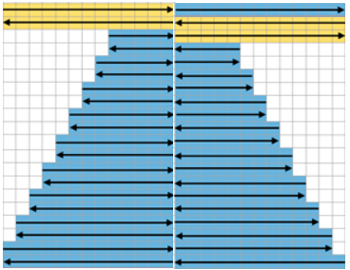 In two row sequences these are generally similar to holes created in lace, in longer sequences much larger slits are produced. The latter are often used as planned design elements. 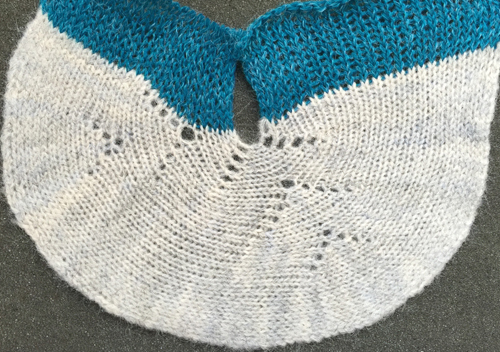 The small holes being visible may not pose a problem for the knitter. 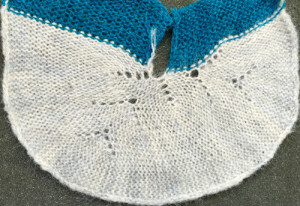 If they do, wrapping the adjacent needles can help eliminate them, but the doubled yarn in the wrapped needle may create small, sometimes visible bumps on the knit side of the finished piece, creating a secondary pattern. 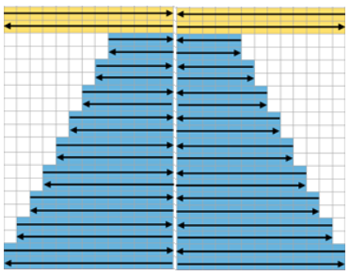 Decreasing: if COR (COL), to hold 1 stitch at a time, set the machine for holding. Bring one needle on the same side as the carriage into hold position. Pass the carriage to the opposite side. COL (COR) repeat if shaping is 2 sided, or if shaping is only on the starting side, knit back to it, and with COR (COL) repeat process. 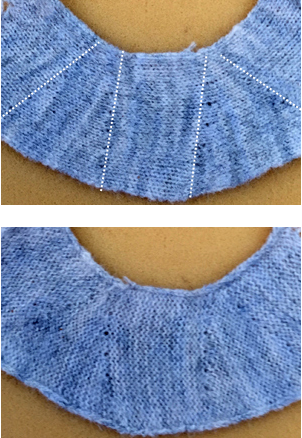 Increasing single stitch : bring 1 needle always opposite the carriage into work position. Decreasing: more than 1 needle or stitch at a time: if COR (COL), place 1 needle less than required into hold on the opposite side as the carriage, knit 1 row to left (right), toward the needle in hold. When COL (COR), bring into hold the last, additional needle. COL (COR) repeat if shaping is 2 sided, or if shaping is only on the starting side, knit back to it, and with COR (COL) continue decreases on the single, opposite side. Increasing: to remove stitches from holding , COR (COL) place the desired number of needles into working position on the side opposite the carriage, knit one row, repeat with COL (COR) if shaping is on both sides, or knit back to starting position COR (COL) and continue increases on the single, opposite side. 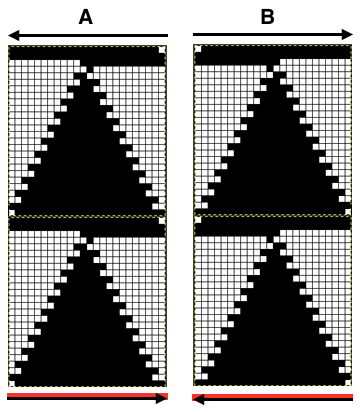 Charting out shapes knitting or programming stacked equal triangles / spirals: the wedge illustrated in the previous post “Air knitting” is often used to think out fabric issues before swatching using yarn. 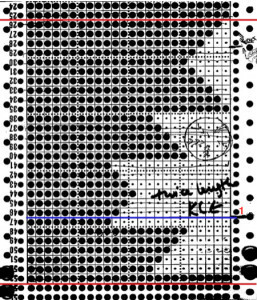 Drawing lines to follow carriage movement direction required to keep the knitting continuous, whether or graph paper or within software programs, can help sort out shapes that will work in short rowing. Holding needs to happen in 2 row sequences. 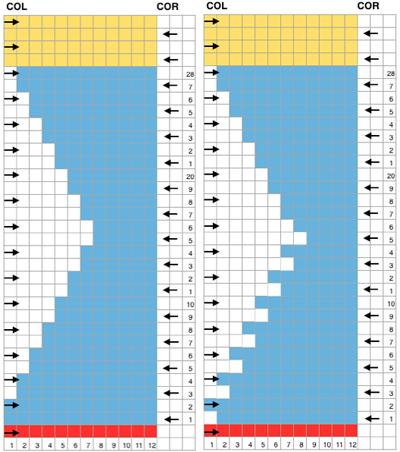 Below, black lines and arrows indicate the direction of knitting for each row, in this instance beginning with COR. Blue = knit stitches, yellow = all knit rows at the completion of each wedge (2 or multiple of 2, depending on planned design). This repeat is suitable for knitting a continuous strip with ruffling/spiraling at various degrees, not for ‘pie’ shapes. 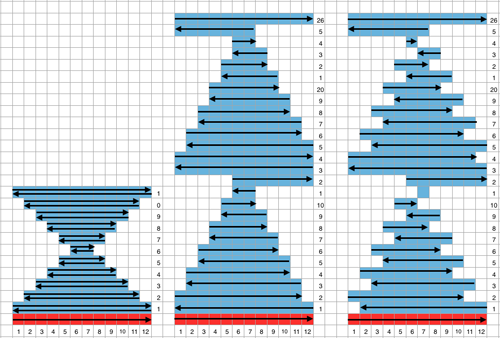 Working out the repeat: the red line represents the starting, selection (KC), knit row, the numbers at the bottom the width of the repeat, the numbers to the side its height. 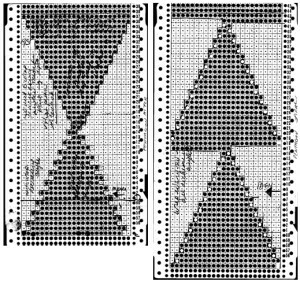 The first repeat A, results in the fewest punched holes, drawn squares or programmed pixels, requires being knit double length. The remaining repeats (B, C) are drawn double length, standard card rotation is used. Eyelets form at the held edge. C takes automatic wrapping to decrease eyelet size at held edge into account. 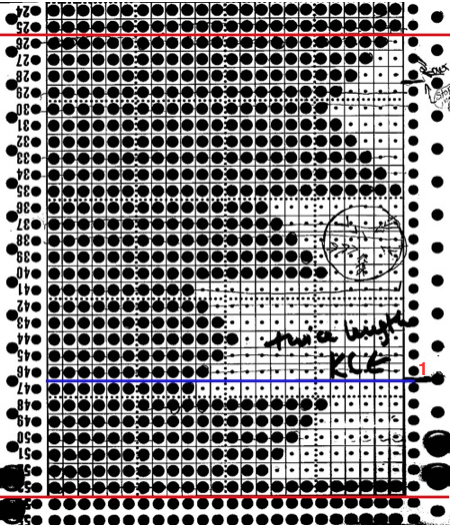 When any sequences are programmed for knitting using slip stitch, the end needle selection is always cancelled by using KCII, or turning non needle selection cams in punchcard models. 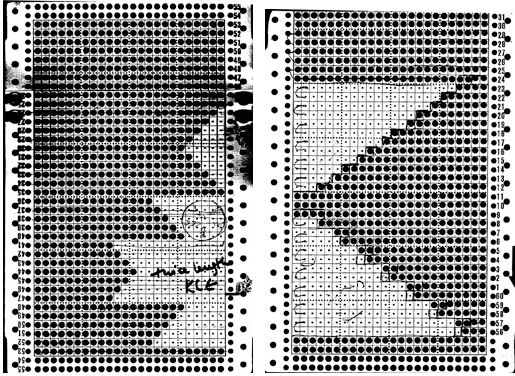 Not just for electronics: some punchcard repeats to try (also suitable for any machine). End needle selection is cancelled. Selection rows are always toward the first pair of rows knit in holding pattern, so for the first 2 cards they would be from right to left. 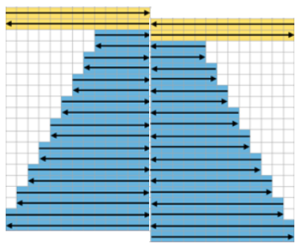 Single rows are punched but 2 row sequences are needed, so cards must be elongated X 2; miter shaping repeat is shown on the left, spiral on the right. 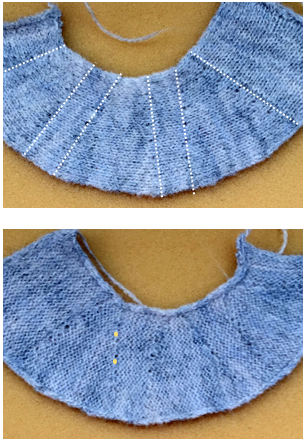 Narrower shapes may be created and knit on the appropriate segment of the 24 stitch repeat needle positions. Use needle tape markings as guides for placement. 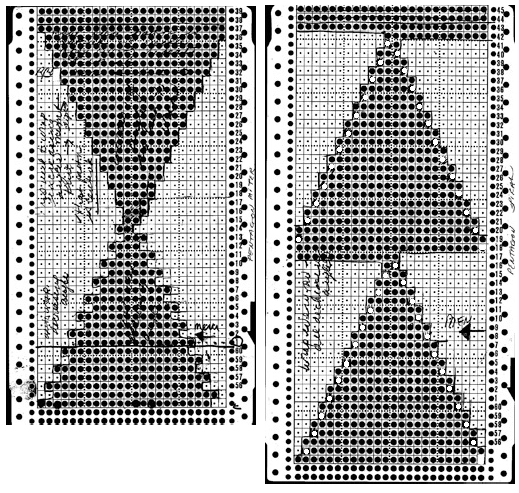 Selection row is from right to left, the pattern repeat begins with COL. All punched, extra series of pairs of rows of knitting may be added at the top. Note: just a few rows may not be added with a small a segment of an additional card with clips, the whole repeat may have to be split in sections to allow for the extra rows and its smooth passage through the card reader. As an alternative, more rows of all holes could be added to the original card when first punched, tested, and then trimmed if not needed. It is useful to try out the repeat as a hand technique first in any of these instances, to determine personal preference. 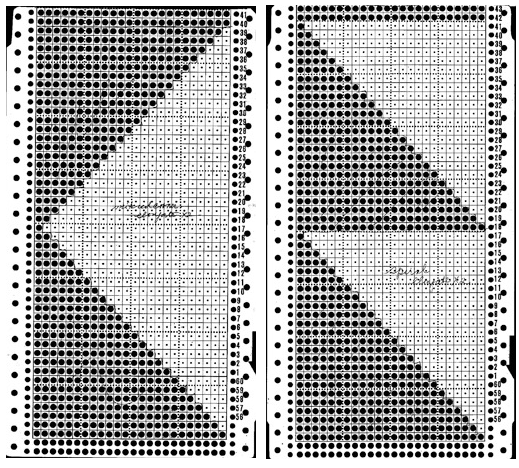 Going 3D: punch only actual holes (black pencils marks were originally used to mark squares that needed to be unpunched for auto wrap on right, not the best choice for B/W scans). 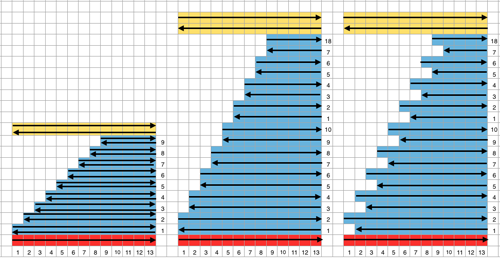 Two row sequences are punched, so no elongation is needed for either repeat. Miter shaping is shown on left, spiral on right; mem <– indicates direction for KC row; decreasing angles are auto wrapped, increasing angles need not be as seen in the top of miter on left, where needles are returned back to work to create the reverse shape. Some ruffle possibilities: all knit rows were added to the card on left with snaps, and are composed of all punched holes. The number of all knit rows between held segments determines the spacing between wedges and the degree of spiraling of final fabric. KC row needs to be R to L for A, left to right B. Holding sequences are now staggered, changing the angle of the resulting curves. Where 2 stitches are brought to hold on the carriage side, a short float is created. 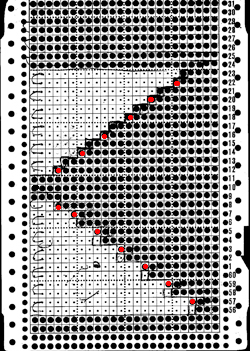 B: dotted lines outline segment: yellow dots on purl side, the 1 needle floats one possible card revision: red dots indicate punched holes, stitches in hold as carriage moves from left to right any difference in the swatch, in this yarn, was almost imperceptible; results would vary depending on yarn thickness and fiber content.